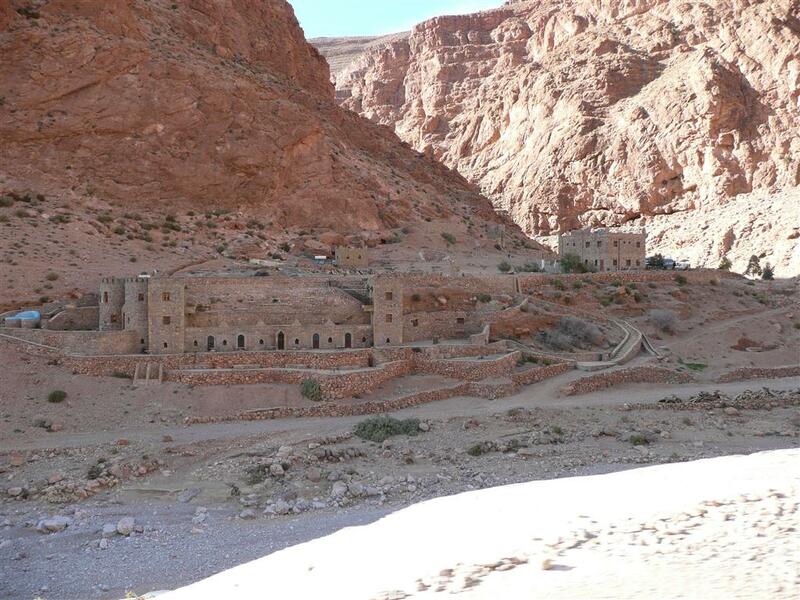 Week 14 – Azrou to gorges du Todra Morocco – Do your dream! Overnight the temperatures plummeted and the rain turned to snow which closed the one and only road/pass to our next destination. In the morning the pass was open to all except lorries, so we ventured over through a snowy landscape. The pass was fairly clear and gritted so no real problem. 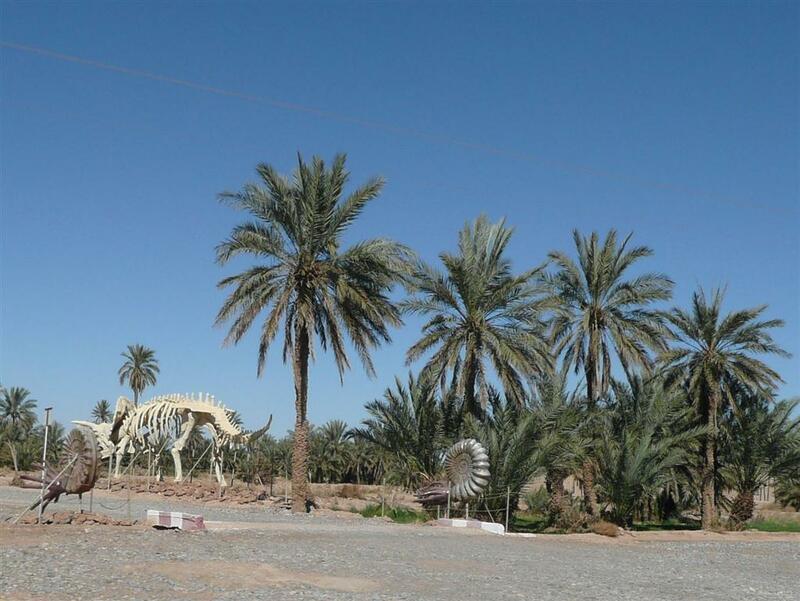 The landscape changed fairly quickly from lush green fields, to snow, then to rocky and arid desert landscape – quite bizarre, and then the faces and people seemed to change the other side of the mountains. A top up of diesel cost a staggering 360 dirham, which when converted to UK price is 56p a litre. 56p!!!!! Think I’m going to take a trailer back loaded with drums. 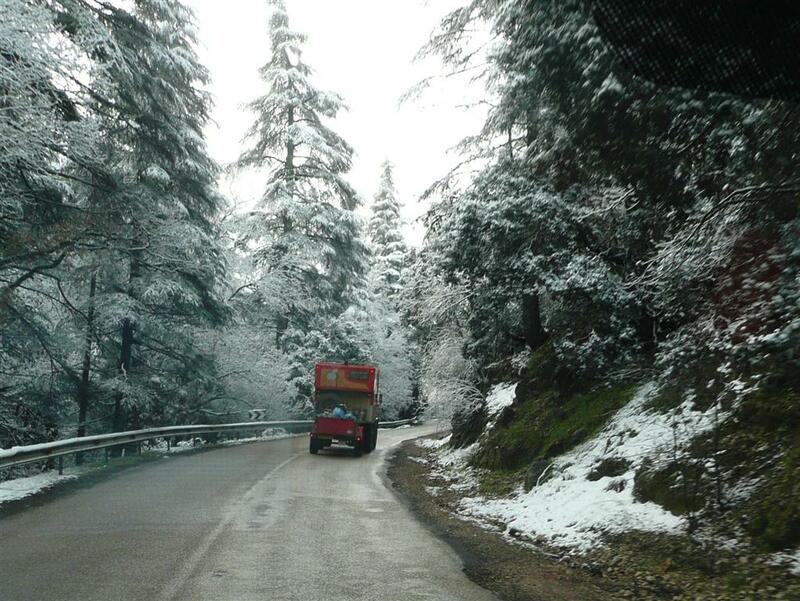 Some of the passes were superb to drive on and the agility of the little vans shone through as we whipped up and down the twisty roads. Near a place called Rich the landscape became awesome and quite beautiful – with canyons, little oasis’ with grass and palm trees, and a stunning bright blue lake (dammed reservoir) – really out of this world. In good hot sunshine we got to our oasis site in Source Bleue de Meski where the Berbers tried to trade everything. We were loaned a carpet and given some tea and he showed us his home, but as a Berber he made out he was more interested in trading rather than. Sadly we don’t have many things with us – like spare clothes, old mobiles etc. No doubt when Allah isn’t looking he’ll get a beer from us. Annoyingly the lovely sun vanished and it started raining and hailing again! Not quite our idea of an oasis but a laugh nevertheless, and it didn’t spoil drinks and socialising around the campfire. T he following day we had a local tour of the village where the tour company sponsor a school and mother/child area which was actually very interesting seeing how the village is built and sustained. But we aren’t overly comfortable being “tourists” as we feel like we are intruding into the locals way of life, even though the vast majority are friendly and just want to say hello. The continued badgering around the campsite, though not pressured, became annoying to the extent we had to become blunt and cancelled any intention of looking around the shops. The trading element always ended in “Oh – and you need to pay AS WELL” – don’t get caught out. To be fair though, this is Africa and is expected, just not enjoyed. For the afternoon we ventured on a walk to the old Meski Kasbar – where the old town (unused for 70 years) was in an old defensive position but as the good building material (e.g. wood) was removed it looked like Pompeii! The surrounding views though were superb. The evening was a very enjoyable meal with genuine live African band with music and dance, and Mel turned into a little Diva on the floor! After our first dry night our journey continued via a local school (sponsored by the tour company) which was interesting, very nice to see the manners and positive attitude of the children – really quite impressive and positive for the future of Morocco. From here we continued towards Rissani via a fossil factory where they make very good (though pricy) ornaments and furniture from rock. Very high quality but too heavy for the van. Rissani itself is an unspoilt typical Moroccan town – very hustle-and-bustle but also not as scary as it looks. We bought food from the market at very reasonable prices and weren’t really hassled at all even though I did succumb to giving a kid a few dirham. 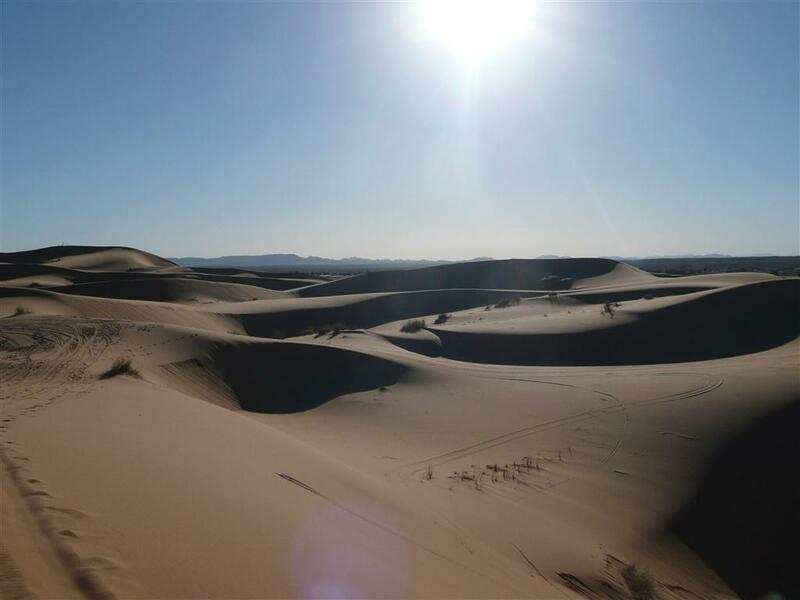 After stocking up with supplies we headed deeper into the Sahara (though clearly still the outskirts) to Merzouga to stay near the Erg Chebbie dunes near the Algerian border. The entire days drive showed some stunning scenery and places and we are seeing new and genuine things every few minutes. The views alone are out of this w orld and sadly the impression won’t be captured by photos and the brain can only remember so many unique visions in a day! The camping area is next to a small hotel, but apart from that there is nothing for miles around – just dunes and open plain, and it is one of the most spectacular spots we’ve stayed at. 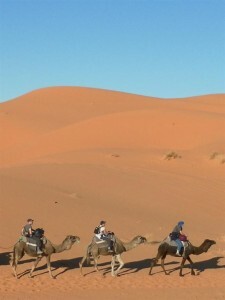 The following day was fairly relaxed until we headed out on camel back into the dunes to a Berber camp as the sun set. 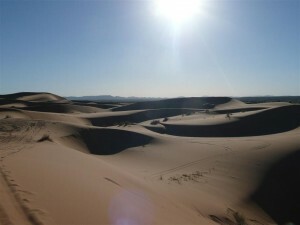 The camp is in a spectacular place appearing as you crest a small dune with a small flat plain and a large dune behind it. 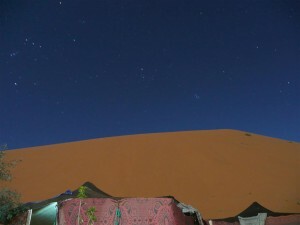 With a truly lovely night with meal and good company, we enjoyed the clear windless skies, full moon and loads of stars with the dune backdrop over a campfire and music. OK quite touristy, but it was as authentic as it could be, including having to go to the loo “somewhere” in the sand outside! We all dossed down in the Berber tents for the night until 5:30am when we got up and rode the camels back, stopping only to walk up a dune and watch the sun rise over the Sahara. The sun rise can be described as simply awesome, magical, spectacular, or really just “something special”. Yeah – it was just a sunrise over some sand, but the actuality of appreciating how far we’d come came home to us all, and it was a beautiful event. Anyway, after getting back and examining my bits for bruising from the camel, we had a hearty breakfast and ventured out on a 4×4 tour of the Erg Chebbie dunes, stopping at numerous places: An area where they dig up the fossil rock, with literally millions of rocks around; A spot as close to the Algerian border which you can safely get; A cobalt mine which appeared to use ancient methods to get the core rocks; an old slave village where we were treated to more (and very good) live African music; and a genuine nomadic house where they had some baby goats and chickens – no doubt on the menu for the “new baby” festivities! Again a superb day with continuous new things to see and “wow” views on every turn. Annoyingly, somehow, I seemed to catch man-flu from somewhere. I mean – who goes to the Sahara desert and catches a flippin’ cold!? 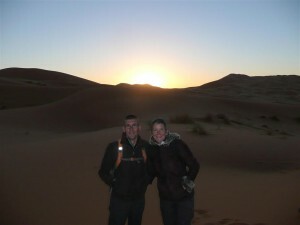 So our last night there we had a quiet night whilst my nose ran like Niagra falls – hopefully its just down to the Sahara dust. The next morning we headed to a campsite at the top of Gorges de Todra. On the way a lunch stop was had at a water/spring/nomad museum which was quite interesting – and the guy running it is interesting and also quite an artist. Well worth a stop. Then the route to the campsite was pretty much out of this world. Without sounding like a bore, the route to the bottom of the gorges was full of little villages and towns which were superb to view, loads of waving kids and smiling faces. We stopped in Tinjdad for some supplies and actually felt quite comfortable and almost at home – shopping in random food shops, bakeries, and even buying fresh bbq’d chicken from a street seller – all with zero hassle and genuine prices. Once entering the gorge, the 30km drive through the centre of the gorge must go down as one of the most spectacular drives we’ve done. Driving through the centre of sheer rock faces next to a (thankfully) quiet river; little villages and green oases along the way. The rock formations were stunning and we are very much looking forward to the reverse run down the gorge next week. For the evening we retired to ibuprofen, coffee, beer, and DVD whilst I fight the man-flu away. The following day quite a few others went on a tour of the mountains, Berber style, in the back of a dumper truck – pretty much everyone raved about the tour and had I been up to it I’m sure it would have been great. As it was the day was chilled and we just pitched in helping with laundry and van maintenance helping to fix minor problems with others’ vans, then a meal in the evening that wasn’t actually that great. 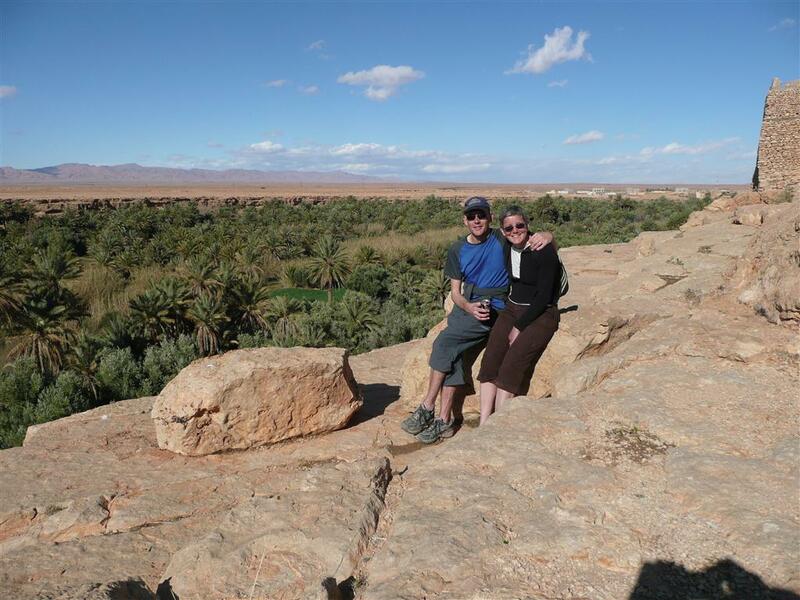 However, week 14, our second in Morocco has impressed at least as much as the first week. Stunning and memorable things to see and experience every day, and we are finding the country and people most welcoming. The weather has also turned to being perfect – so all in all one of our best weeks ever touring. 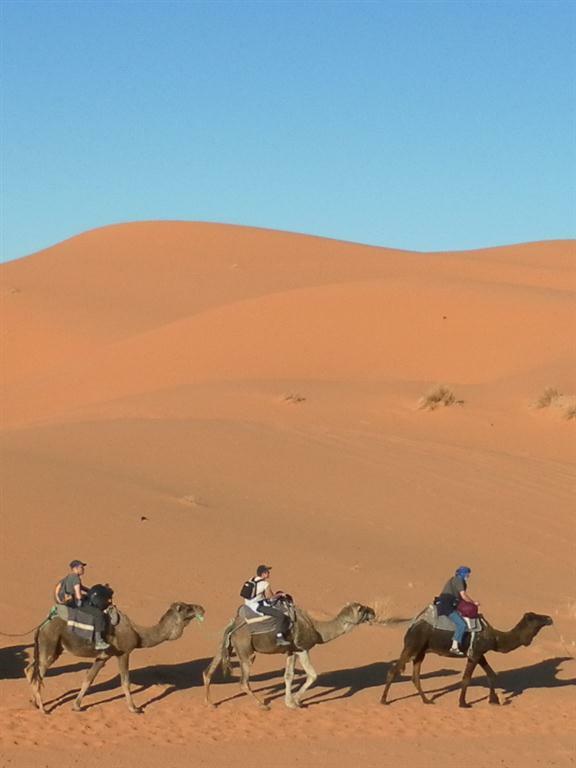 Despite our low expectations, Morocco is delivering far more than our wildest dreams. Superb.